Is It Safe to Drink From Your Garden Hose? So you're out watering your container gardens (OK, so what else is new?). It's hot, you're thirsty, and there is cool and lovely water flowing out of the hose. You stoop down to get a nice cool drink. Wait! Here’s the bad news: Your garden hose may be hazardous to your health. Many hoses are made of polyvinyl chloride (PVC), which uses lead as a stabilizer. When water sits in a hose that uses PVC as a stabilizer, lead can leach into the water in concentrations that, according to tests conducted by Healthystuff.org, can reach significantly higher levels than what's considered safe. PVC hoses often carry a warning, for example as required by the State of California: “This product contains a chemical known to the State of California to cause cancer and birth defects and other reproductive harm.” Unfortunately, this is often printed either in a microscopic font or on the underside of the label, which you can’t even see until you get the hose home and open it. Even worse, some hoses that leach lead don't even have a warning. Lead is an enormous health threat that tragically is particularly hazardous for children under the age of six because it can permanently damage developing brains and nervous systems. It appears that plants don’t generally absorb lead, unless there is a high concentration of it in the soil, but think about the impact of watering your container gardens with lead-laced water on a regular basis. Particularly because one of the truly nasty things about lead is that if you don’t do anything about it, it hangs around in the soil for an awfully long time. The good news is that you can buy hoses that are lead-free. They are made from FDA-approved materials and the fittings are often nickel-plated because brass can also leach lead. They are labeled "drink-safe," or "safe for potable water." With any hose, even one labeled "drink-safe," it's a good idea to let the water run until it's cold before you drink from it because bacteria can grow in warm standing water. 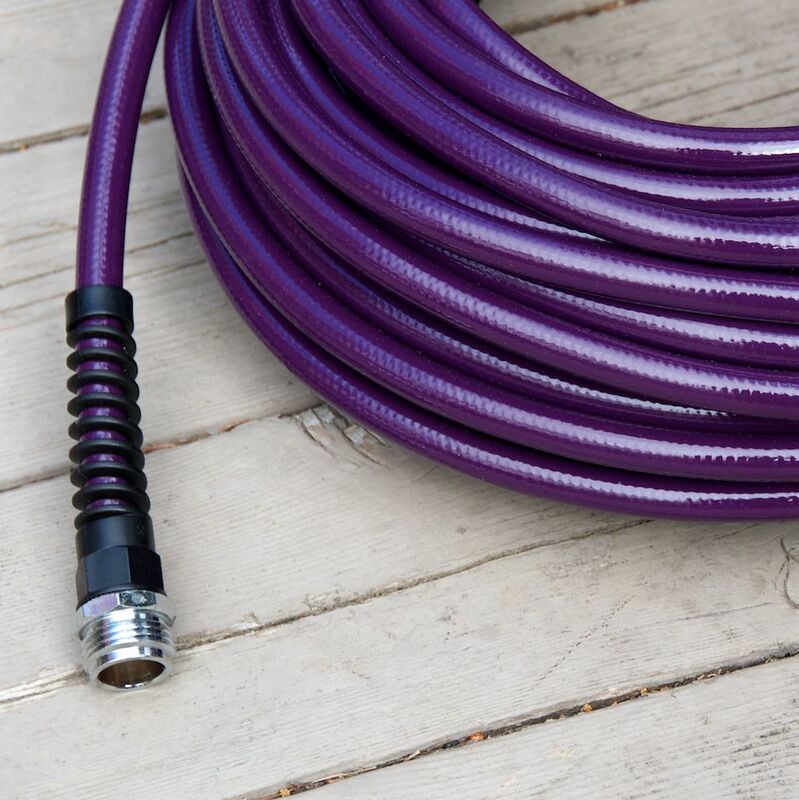 Gardener's Supply carries a superslim lightweight hose that meets National Sanitation Foundation (NSF) drinking-water standards. It comes in 25- or 50-foot lengths. Armadillo Hoses are all drink-safe and come in lengths up to 100 feet. They'll even make custom sizes, and some of their hoses are chew-proof. Water Right Slim & Light Polyurethane Garden Hoses and the Water Coil Hoses. Flexzilla hoses are fabulous too. They are lightweight, resist kinking, and are incredibly well-made, featuring a special 'o' ring that creates a seal between the hose and the faucet to reduce leaking. What is the Correct Method to Harden Off Garden Plants? Don't Drown Those Precious Plants in Your Container Garden!